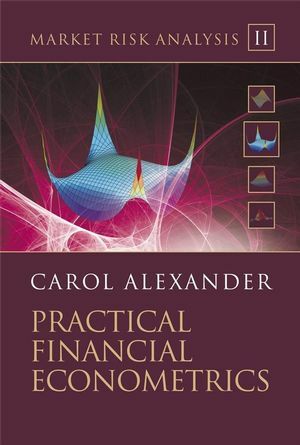 Written by leading market risk academic, Professor Carol Alexander, Practical Financial Econometrics forms part two of the Market Risk Analysis four volume set. It introduces the econometric techniques that are commonly applied to finance with a critical and selective exposition, emphasising the areas of econometrics, such as GARCH, cointegration and copulas that are required for resolving problems in market risk analysis. The book covers material for a one-semester graduate course in applied financial econometrics in a very pedagogical fashion as each time a concept is introduced an empirical example is given, and whenever possible this is illustrated with an Excel spreadsheet. Non-linear quantile regressions with applications to hedging. II.1.4 Case Study: Estimation of Fundamental Factor Models. II.1.5 Analysis of Barra Model. II.1.6 Tracking Error and Active Risk. II.2.2 Review of Principal Component Analysis. II.2.3 Case Study: PCA of UK Government Yield Curves. II.2.4 Term Structure Factor Models. II.2.5 Equity PCA Factor Models. II.3 Classical Models of Volatility and Correlation. II.3.5 Precision of Equally Weighted Estimates. II.3.6 Case Study: Volatility and Correlation of US Treasuries. II.3.7 Equally Weighted Moving Averages. II.3.8 Exponentially Weighted Moving Averages. II.4 Introduction to GARCH Models. II.4.2 The Symmetric Normal GARCH Model. II.4.7 Monte Carlo Simulation with GARCH Models. II.4.8 Applications of GARCH Models. II.5 Time Series Models and Cointegration. II.5.5 Modelling Short Term Dynamics. II.6.3 Copulas and Associated Theoretical Concepts. II.6.5 Conditional Copula Distributions and Quantile Curves. II.7.3 Case Studies on Quantile Regression. II.7.4 Other Non-Linear Regression Models. II.7.6 Modelling Ultra High Frequency Data. II.8 Forecasting and Model Evaluation. II.8.4 Forecasting the Tails of a Distribution.